The Canadian lynx (Lynx canadensis) is a North American mammal of the cat family, Felidae. It is a close relative of the Eurasian lynx (Lynx lynx). Some authorities regard both as conspecific. However, in some characteristics the Canadian lynx is more like the bobcat (Lynx rufus) than the Eurasian lynx. With the recognized subspecies, it ranges across Canada and into Alaska as well as some parts of the northern United States. With a dense silvery-brown coat, ruffed face and tufted ears, the Canadian lynx resembles the other species of the mid-sized Lynx genus. It is larger than the bobcat, with whom it shares parts of its range, and over twice the size of the domestic cat. 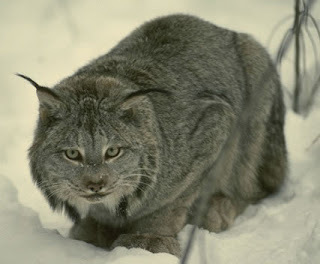 L. canadensis subsolanus: The Newfoundland lynx is a subspecies of the Canadian lynx. It is larger than the mainland subspecies. This animal is known to have killed caribou calves when snowshoe hares were not available. The appearance of the Canadian lynx is similar to that of the Eurasian lynx: the dense fur is silvery brown and may bear blackish markings. The Canadian is rather smaller than its Eurasian cousin, at an average size of 11 kg (24 lbs), 90 cm (36 in) in length and a shoulder height of 60 cm (24 in). Males are larger than females. In summer, its coat takes on a more reddish brown colour. This lynx has a furry ruff which resembles a double-pointed beard, a short tail with a black tip and long furry tufts on its ears. 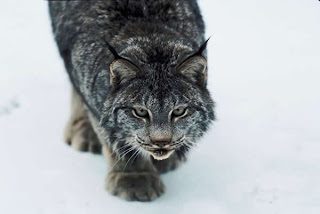 Its long legs with broad furred feet aid the Canadian lynx in traveling through deep snow. The Canadian lynx is a solitary and secretive animal, usually active at night, and requires a large territory. It breeds in spring and two to four cubs are born. The survival of the young depends heavily on the availability of prey species. 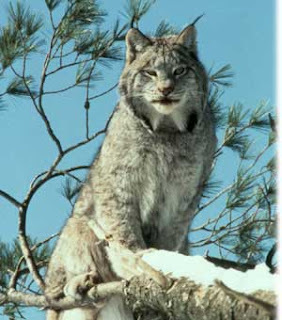 The Canadian lynx hunts for hares, rodents, birds and sometimes kills larger animals such as deer. It relies mainly on hearing and sight to locate prey. In some areas the snowshoe hare is virtually the only prey of the Canadian lynx. The size of the Canadian lynx population tends to follow the approximately 10 year long rise and decline of snowshoe hare numbers. Female Canadian lynx use maternal dens from birth of their young until they are weaned and able to forage for food themselves. Typically inside thickets of shrubs or trees or woody debris, dens are generally situated mid-slope and face south or southwest. 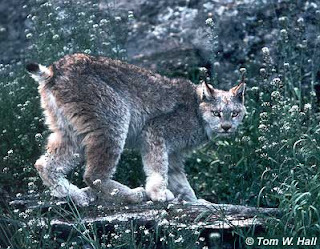 This cat is found in northern forests across almost all of Canada and Alaska. In addition there are large populations of this lynx in Montana, Idaho and Washington and a resident population exists in Yellowstone National Park, Wyoming that extends into the Greater Yellowstone Ecosystem. 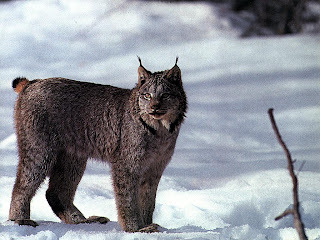 The Canadian lynx is rare in Utah, Minnesota, and New England; reintroduction efforts in Colorado have been ongoing since 1999, with the first wild-born kittens confirmed in 2003, with many successful kindles thereafter. The Canadian lynx is a threatened species in the contiguous United States. In the United States, prior to 1999, lynx were known to occur only in Alaska, Washington state, Maine, Minnesota, Montana, Wyoming, Idaho and possibly in Michigan. Starting in 1999, the Colorado Division of Wildlife began a program reintroducing a wild lynx population back to Colorado. While showing early signs of promise, biologists say it will take more than a decade to determine whether the program is a success. However, in 2006 the first case of a native-born Colorado lynx giving birth since 1999 was documented: it gave birth to 2 kittens, affirming the possibility of successful reintroduction. In the United States, prior to 1999, lynx were known to occur only in Alaska, Washington state, Maine, Minnesota, Montana, Wyoming, Idaho and possibly in Michigan. Starting in 1999, the Colorado Division of Wildlife began a program reintroducing a wild lynx population back to Colorado. While showing early signs of promise, biologists say it will take more than a decade to determine whether the program is a success. However, in 2006 the first case of a native-born Colorado lynx giving birth since 1999 was documented: it gave birth to 2 kittens, affirming the possibility of successful reintroduction. The Canadian lynx is trapped for its fur and has declined in many areas due to habitat loss, and the IUCN lists them as Least Concern. On 24 March 2000, the U.S. Fish & Wildlife Service issued its Final Rule, which designated the Canadian lynx a Threatened Species in the lower 48 states.